Last week, I mentioned that I had lucked into a New Years themed beer, and this is the one. 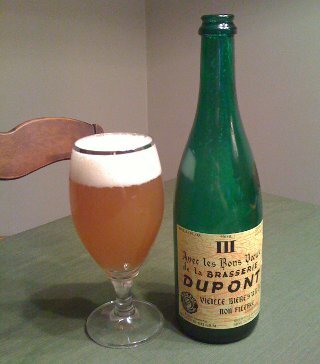 The name Avec Les Bons Voeux de la Brasserie Dupont translates to "With the best wishes of the Dupont Brewery" and was originally brewed in very small batches and given to select clients as a New Years gift. It has since become a regular Winter seasonal for Dupont, but it's apparently still somewhat rare to find. Lucky for me, Wegmans (of all places) had a few of these available, and while I recognized the brewery, I didn't realize at the time that it was somewhat rare - once I realized what it was, they were sold out. This brewery is known mostly for Saison Dupont and this New Years brew is along similar lines, only stronger. The saison style of beer isn't exactly winteriffic, but then, I suppose there's a champagne-like quality to the beer that makes it appropriate for New Years (that might be a bit of a stretch, but it's nowhere near the stretch of, say, Sierra Nevada Celebration). Beer Nerd Details: 9.5% ABV bottled (750 ml, caged and corked bottle). Drank from a goblet. This page contains a single entry by Mark published on January 2, 2011 8:39 PM. Flying Dog was the previous entry in this blog. Double Feature: Hoppyness is Happiness is the next entry in this blog.